Fly to Tromsø and transfer with ‘Flybussen’ to the Clarion Collection Hotel With for 2 nights. Enjoy an evening at leisure. Choose from one of the many excursions (please contact us for details). There is ample time for both an Arctic adventure and to enjoy the city. Collect your hire car and head south for Senja. The journey will take you over high plateaus and alongside mountains that plunge into the sea. Break the journey with a snowmobile or husky safari or stop off at the Polar Park, which offers a unique opportunity to enter a wolf enclosure. Arrival at Hamn i Senja uncovers a hidden gem. Large suites have a luxury kitchen and living room with floor to ceiling windows framing the ever changing scenery. A 3-course dinner is served in Storbrygga Restaurant and we recommend retreating to the Lighthouse for a digestif and 360° views over the surrounding fjord and mountains. The hotel has a range of activities that showcase the best of the region according to the season. 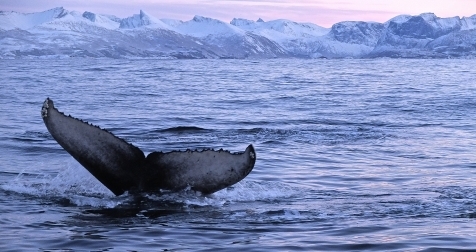 In January killer and humpback whales follow the herring into the fjord. RIB boat rides reveal islands ringed with coral sandy beaches and soaring sea eagles. There are plenty of photo opportunities along the National Tourist Route. 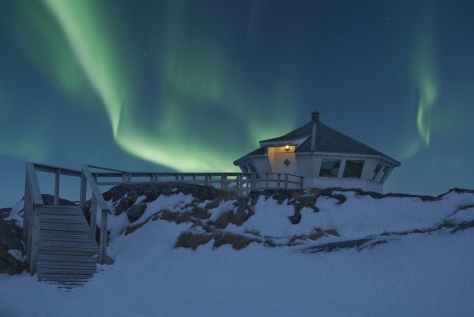 After dinner choose to relax in your suite, the Lighthouse or for the more energetic, try a northern lights snow shoe walk. After breakfast drive back to Tromsø before dropping off your hire car in time for your flight home. 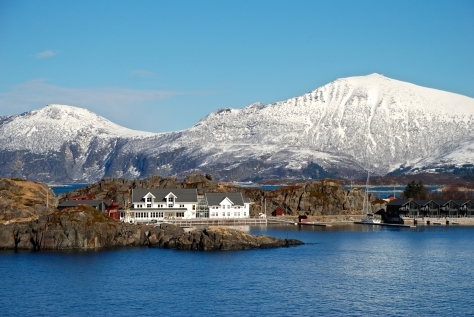 Hamn i Senja’s can only be described as a hidden gem and its setting is simply stunning. This former trading and tiny fishing village has been converted into an idyllic harbour haven, nestled on the shores of Senja in Northern Norway. 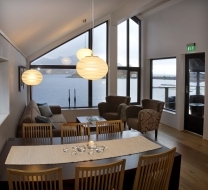 Accommodation ranges from hotel rooms to suites, some (in our opinion) with the best views Norway has to offer. The restaurant naturally offers seasonal local product with a strong emphasis on freshly caught seafood. And one cannot fail to be enchanted by the ‘lighthouse’ from where you can enjoy 360° views. Skirt idyllic islands in a turquoise sea, whilst searching for humpback & killer whales (02 Jan – 05 Feb) sea eagles, seals, porpoises and more. A special protective Arctic floating suit keeps you warm and dry as you drift in the streams maelstrom and see the world from a different perspective in a Body Rafting experience. Alternatively participate in some Atlantic Bathing outside the hotel for a dip with a difference. Senja’s coast is celebrated as one of the most beautiful landscapes in Norway. The National Tourist Route on Northern Senja reveals long white sand beaches and steep mountains that plunge into the ocean. There are ample opportunities to stop at some of the most beautiful and interesting places along the way to Ersfjorden. Picnic lunch and hot drinks included. Master the easy art of snow shoeing then head out with your expert guide into the stunning surrounds. Where you go will depend on the weather and snow conditions but there will always be plenty of stops to enjoy the views and the quiet surroundings. Hot drinks will be served and an easy pace will be followed. Good winter clothing and walking boots required or they can be hired from Hamn. Departing Hamn, you head for a place where you can watch for the lights without any light pollution or noise, just the wilderness (hopefully) a dancing light show. When there is no snow on the ground, we go hiking and when there is snow on the ground we go snowshoeing. 4 days (4x24 hrs) Group B car hire (VW Polo or similar) inclusive of unlimited mileage, CDW, theft protection and all applicable taxes. Winter tyres are fitted according to Norwegian law.